World Through Violet Colored Lens: Last Day! The last day of my 7-day vegetarian diet challenge, and I totally overslept. I got up a whooping hour later than I should and jumped out of bed. I was going to make peanut butter toast with banana for breakfast, but scratched that, no time. Instead I pulled the tub of greek yogurt out of the fridge and grabbed a banana and ran out of the door. Work was busy as usual, although it was better than yesterday. So I was able to steal a moment and made myself a coffee and chowed down a couple pieces of pita chips I keep at work just for that exact purpose. I ate that last bit of yogurt with the banana and oat bran for lunch. It was fantastic. Greek yogurt is probably the reason I would have to be at least a lacto-vegetarian. For my last meal on the challenge, I decided to make a rice bowl. Rice, veggies, soy cause with shallot, and natto. 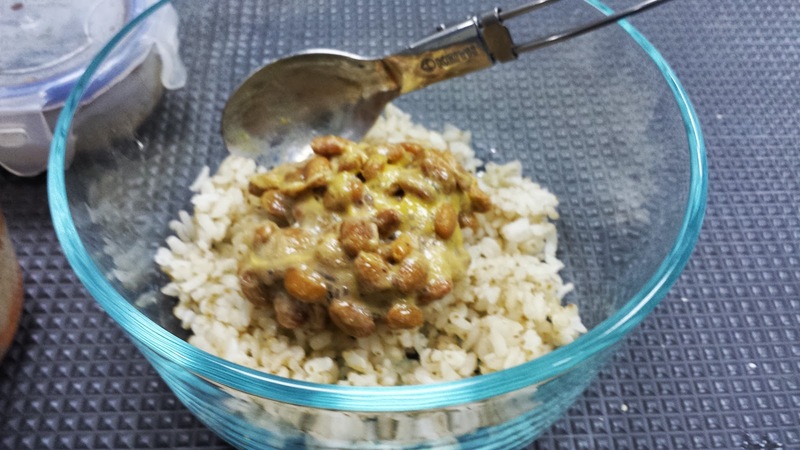 Natto is basically fermented soy beans, it is sticky and smelly, and is kind of an acquired taste. I was first introduced to the unseemly brown beans by this manga, and then through a Japanese friend of mine I finally tried it in college. I liked it immediately, it was a little salty, a little bitter, but not unpleasant at all. I seem to be in the minority, however, since even some of my Japanese friends won't eat it. It was cheap and also very easy, cooked some rice and put it on top and it was lunch or dinner. When you live in a dorm room with very limited kitchen access, easy is very important. Once I moved out of the dorm and into an apartment I was cooking for four boys and myself, so I didn't eat of natto then. It wasn't particularly hard to find in Hong Kong, but I've kind of forgotten about it by then. So it wasn't until about a year ago when I came upon a discounted package of it (discounted because it was nearly expired, apparently Hong Kong people don't care for it). They mostly came in package of three little Styrofoam boxes with soy sauce and mustard included. I ate them all within the week, much to the disgust of my mother who wrinkled her nose and told me it even smelled revolting. Until the new Japanese supermarket opened about a month ago, the supply of natto at the other supermarket in my area was sporadic and unpredictable. Now, I know where to find them if I want them. The whole rice bowl idea came from having natto in my fridge. I thought I ought to add more vegetables to the meal, so I cooked up some carrot, cucumber, and pumpkin. Just in case it tastes bland, I made a little container of dressing with diced shallot, sweet soy sauce and sesame oil. 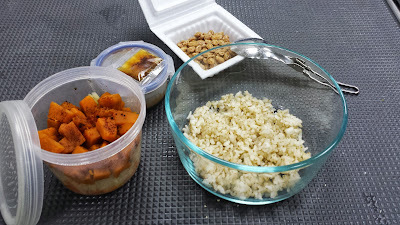 To assemble the rice bowl at work I heated up the brown rice and the vegetables, mixed the natto with its pack of soy sauce and mustard and scooped it out on top of the rice. Then I dumped the container of vegetables on top of it. And if you think the natto sounds odd, and it didn't look very tasty in the picture above. Just wait... it get better. Yum, sticky, smelly, natto rice bowl. This is what it looked like all mixed together. Not the best looking food around, is it? But it was quite good in my opinion, but then again I do like natto. I added some hot chili oil to it and promptly finished the bowl. I like this rice bowl idea. With this, my challenge comes to an end. I am feeling pretty good about finishing the challenge with only one slip up. I didn't miss the meat too much and I almost never went hungry in the past week. I didn't actually weigh myself before I got started, but I can tell I've lost weight. My body is slimmer and leaner, and I didn't feel like I needed the meat to function. My eating habit definitely had gotten better because of this. I am more conscious of what I am eating, the balance of vegetables, the need for lean protein and carbohydrate. It is definitely limiting at times, when occasionally I would think about some of the food I would normally eat and then suddenly remembered 'oh, right, can't eat this now!' Am I going to continue with my vegetarian diet? Probably not a strict one. Living in Hong Kong made it quite difficult to avoid all meat product, especially when I am out with family and friends. I will, however, continue to pay close attention to what I am eating on a daily basis.